Fourth and fifth graders of ET Hamilton learned professional-level hockey skills from a local ice rink. On Jan. 24, members of the Flyers Skate Zone spent the morning teaching street hockey skills to fourth and fifth grade students of ET Hamilton School. While Super Bowl banter rocks the region, Voorhees students are making some sporting moves of their own. On Jan. 24, fourth and fifth graders of ET Hamilton Elementary School took a break from their regularly scheduled PE class to acquire street hockey skills from athletes of the Flyers Skate Zone. 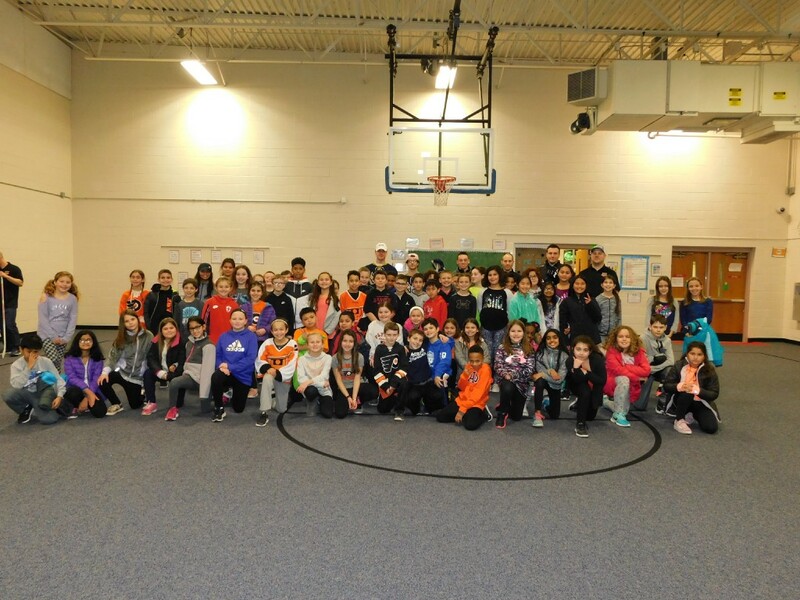 The training center’s hockey academy has been conducting outreach initiatives with South Jersey schools over the past two years, teaching professional-level skills practiced by the Philadelphia Flyers to elementary students. Often, physical education is susceptible to budget cuts, so the program feels especially adamant about offering a free, 45-minute class to kids, encompassing several skill stations such as dribbling, passing and intramural games. The hockey academy aims to visit schools close to one of its four rinks, which are located in Voorhees, Atlantic City, Pennsauken and Northeast Philadelphia, in hopes that a potential player may unearth a newfound love for hockey. “We felt, with the fitness, we could bring some excitement and hopefully stir some new interest in kids wanting to play hockey,” Hall said. This was the program’s first time visiting Hamilton, as the school’s PE teacher, Rachel White, was immediately interested when Hall reached out to the school a few months ago. Since White leads a hockey unit each school year, she says the students may pick up certain skills, such as stick safety, through the program. Whether sporty or not, she hopes the students gain a new understanding of the athleticism hockey offers. From experienced players to newbies, students enjoyed running through rudimentary concepts such as holding a stick or the fact that righties and lefties require different sticks. Students say the most challenging part of the day was applying recently learned skills to the games, especially while playing against seasoned sportsmen … or women. Lombardi, along with a few others, says the girls had an advantage because they had “the best goalie in the league” on their team. But, overall, students, with hockey sticks in-hand and new orange jerseys, revelled in the recess from academic classes, enthusiastically popping in back and forth from the gym to a pad of asphalt outside.